So says reporter Carl Kolchak to his editor Tony Vincenzo, as he tries to convince him to publish his story. THE NIGHT STALKER (1972) is not only one of the best horror movies from the 1970s, it’s also one of the best horror movies period. Even more impressive, it was a made-for-TV movie, which isn’t surprising for the early 1970s, as that part of the decade was a great time for made-for-TV horror movies. Films like THE NORLISS TAPES (1973), GARGOYLES (1972), and TRILOGY OF TERROR (1975) were all made-for-TV shockers. The best of the lot was THE NIGHT STALKER. THE NIGHT STALKER starred Darren McGavin in the role that most of us consider to be his signature role, the inexorable reporter Carl Kolchak. This movie earned such high ratings when it premiered on television on January 11, 1972 that in a largely unprecedented move, it was released theatrically after it played on TV because the film was that popular. Amazing. And it really is a superior horror movie, which is no surprise since it was produced by Dan Curtis, the man behind the Dark Shadows phenomenon. It’s also an incredibly lean production, as it clocks in at just 74 minutes. There isn’t an ounce of fat on this baby. THE NIGHT STALKER boasts a fantastic script, and you would expect no less since it was written by Richard Matheson, based on an unpublished novel by Jeff Rice. The legendary Matheson wrote a ton of movies and so it would be difficult to call THE NIGHT STALKER his best screenplay, but I will say that for me, it’s probably my favorite Matheson screenplay. In 1972 Las Vegas, young women are being murdered, their bodies drained of blood. The authorities want this information kept out of the news to avoid a panic, but reporter Carl Kolchak (Darren McGavin) sees this story as his ticket back to the big time, as he’s been fired from one major newspaper after another, due to his in-your-face abrasive style. Vincenzo recognizes that Kolchak is a top-notch reporter but grows increasingly frustrated that he can’t control him. Their verbal exchanges are some of the liveliest parts of the movie. The vampire, Janos Skorzeny (Barry Atwater) possesses superhuman strength and performs such feats as hurling doctors through windows, tossing police officers about like twigs and outrunning police cars. He’s a type of vampire seldom seen in the movies, and to 1972 audiences he made for a violent shocking killer. He’s quite scary. The film does a nice job building to the inevitable climax where Kolchak finally tracks down Skorzeny. Carl Kolchak was a perfect role for Darren McGavin and it’s no surprise he’s most known for the part. What I’ve always liked about Kolchak in THE NIGHT STALKER is unlike other heroes in vampire movies, Kolchak knew absolutely nothing about vampires. For him, it was just a story, and at first, he didn’t even think it was a real vampire until he saw with his own eyes the vampire in action. He then researches the supernatural, and before you know it, he’s the one who’s telling the police about crosses and wooden stakes through the heart. The vampire scenes in THE NIGHT STALKER are second to none. Barry Atwater makes for a chilling vampire, hissing and dashing in and out of the shadows a la Christopher Lee, and like Lee in some of his Dracula portrayals, Atwater has no dialogue. In fact, Atwater’s performance as Skorzeny is even more visceral and violent than Lee’s Dracula. The success of THE NIGHT STALKER also influenced Hammer Films to make their next Dracula movie, DRACULA A.D. 1972 (1972) as a modern-day vampire tale set in 1970s London rather than the usual 1890s period piece. THE NIGHT STALKER is the superior film, by far. The cast also features Kent Smith as D.A. Paine, Ralph Meeker as Kolchak’s friend and FBI contact Bernie Jenks, and Elisha Cook, Jr. as another of Kolchak’s sources, Mickey Crawford. The best supporting performance though belongs to Simon Oakland as Tony Vincenzo. Oakland would reprise the role in both the sequel THE NIGHT STRANGLER (1973) and the subsequent NIGHT STALKER TV series. Directed by John Llewellyn Moxey, THE NIGHT STALKER is a quick efficient thriller with enough chills and thrills for a movie twice its length. The early scenes chronicling the violent attacks on women in Las Vegas are scary and unsettling, and thanks to Richard Matheson’s superior script, the story moves forward with nearly every scene as the suspense continues to grow..
Moxey worked mostly in television, and he directed other genre TV movies as well. He also directed the little seen Christopher Lee horror movie CIRCUS OF FEAR (1966), also known as PSYCHO-CIRCUS, a West German/UK co-production, and Moxey directed the English language version. 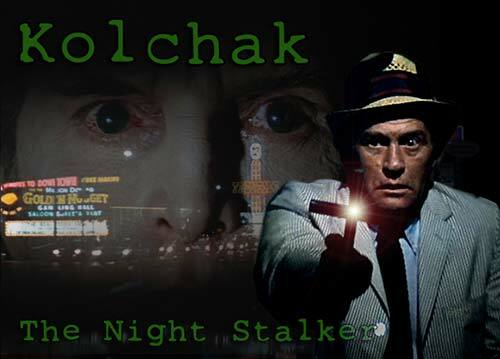 McGavin would play Kolchak again in the sequel THE NIGHT STRANGLER and in the NIGHT STALKER TV series (1974-75), which sadly lasted only one season. 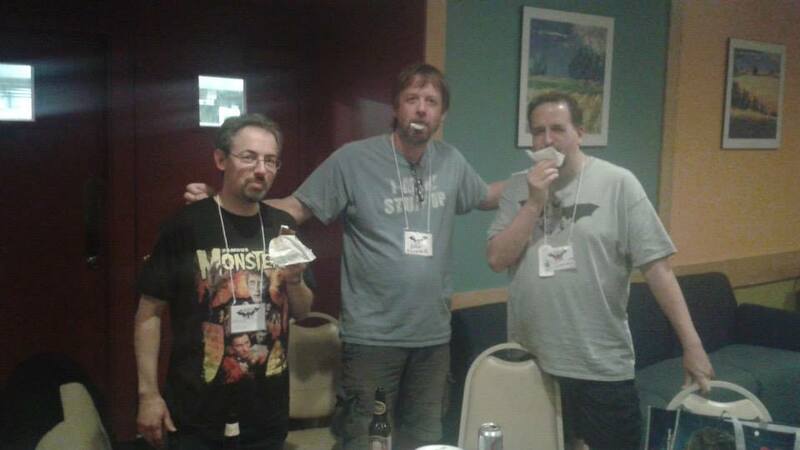 Michael Arruda, Dan Keohane, and Scott Goudsward sharing a goofy ice cream moment at NECON 35. Photo courtesy of Nick Cato. Every summer a bunch of writers and readers descend upon Roger Williams University in Bristol, RI for Camp Necon, a writers’ convention unlike any other. For me, I attended my first NECON back in 2001, as I had heard about it through Judi Rohrig, who at the time was editing the HWA Internet Mailer. Since then I’ve been back every year. NECON is the most relaxed laid back con you’ll ever attend, a place where you can socialize with authors up close. It’s been said before, and it’s true: when you attend this con, it really feels like family. I can attest to this firsthand, because aside from my extroverted writer persona who can banter with the best of them on the written page, in person, I’m pretty much an introvert, and I’m never all that comfortable in social situations. This doesn’t matter at Necon. Whether you’re an introvert, extrovert, reader, writer, what have you, you are made to feel welcome. It’s family. Here’s a brief recap of this year’s Necon, NECON 35, held July 16-29 2015, at the Roger Williams Convention Center. One of these events, the Necon Hawaiian Shirt Contest was tweaked a bit this year, as rather than being a stand-alone event, it occurred over the entire weekend. Secret judges were on the prowl all weekend looking for folks with the best Hawaiian Shirts. For Necon newbies there was a 5:00 event called Jitters: A Necon Primer for Newbies to help the newcomers feel comfortable and at home right off the bat. I spent this time socializing in the lobby, the quad, and the new lounge, a spacious and very comfortable room in which to relax and chat. At 10:00 it was the Saugie Roast, that time to enjoy grilled Saugies, Rhode Island’s own brand of hot dogs, and chat with friends, old and new, long into the night—. After an 8:00 breakfast, I attended the 9:00 Kaffeeklatsch: Promotion in Motion, featuring Jill & Jason Salzarulo, Sephera Giron, David Dodd, and my roommate and New England Horror Authors head honcho Scott Goudsward. This conversation was filled with practical tips and advice on how to better promote your work, especially using social media. At 10:00 it was time for the Kaffeeklatsch: Best Worst Movies featuring myself, Sheri White, Bill Carl, and Nick Cato. We discussed our picks for some of the best “bad movies” ever made, and both Bill and Nick provided extensive lists of classic “good” bad movies. Sheri talked about her love of the bad SyFy movies, and I posed the question, “does it take years for a bad movie to become ‘good’ because most bad movies I see nowadays are simply bad, and the only bad movies I really like are old ones. I suggested the grade z movies that Bela Lugosi made, and named THE DEVIL BAT (1941) as one of my favorite bad Lugosi flicks. I also mentioned the HALLOWEEN series. For me, other than the first movie, HALLOWEEN (1978) the rest of the movies in this series are not what I call good movies. In fact, some of them are pretty awful, yet I like them all. Before the panel ended, Craig Shaw Gardner asked us to recommend one film that we’ve seen this year, and I picked IT FOLLOWS (2015), citing it as one of my favorite horror movies of the year. After the panel, it was nice to catch up with Craig and his lovely wife Barbara Gardner. I skipped the 11:00 Kaffeeklatsch to catch up on some rest, and after a noon lunch, I spent some time at the New England Horror Writers table with Scott Goudsward and friends. At 2:00 I attended the panel Everything Old Is New Again: Bringing New Life to Classic Tropes featuring Paul Tremblay, Lisa Manetti, Elizabeth Massie, John Dixon, and moderator Mary SanGiovanni, and it discussed among other things writing supernatural tropes in a scientific age. Monica O’Rourke moderated the 4:00 panel Piece of Mind: Portraying Mental Illness in/as Horror which included Paul Tremblay, Kristin Dearborn, Dallas Mayr, Heather Graham, and Trevor Firetog. This fascinating panel delved deep into what it takes to write about mental illness in horror effectively. At 7:00 Toastmaster John McIlveen delivered the Official Necon Toast, followed by the hilarious Necon Update with Mike Myers. This year Myers brought down the house with an uproarious account of a complicated hospital visit. The audience was on the floor with laughter. Myers comical update also featured the Necon Eggstravaganza Game which left contestants with eggs on their faces. Literally. At the Meet the Authors Party I hung out with Daniel Keohane, who I hadn’t seen in several years. Always fun to see Dan, who has the distinction of being the first person I ever met at Necon back in 2001. I shared table space with Dan, and also with Scott Goudsward and Nick Cato. I was selling copies of my science fiction novel, Time Frame. I also got to chat with author Gary Frank during this event. At 10:00 it was time for the Necon Olympic events Darts and Foosball. Afterwards, it was socializing on the quad, where I had some memorable conversations with friends old and new, as always. With the publication of my first science fiction novel Time Frame earlier this year, I was very much interested in the 10:00 panel The Horror of the Future: Making Science Fiction Scary, moderated by Gordon Linzner, and featuring Robert Boyczuk, Don D’Ammassa, Linda Addison, Lois Gresh, and Chuck Wendig. This was a fun panel, as it discussed frightening science fiction from yesteryear, and mentioned some classic movies, including two prominent remakes which most folks these days consider superior to the originals, INVASION OF THE BODY SNATCHERS (1978) and John Carpenter’s THE THING (1982). The 11:00 panel was just as good: Fear in Four Colors: Comics, Horror, and Inspiration. On this panel were Christopher Golden, Brian Keene, Errick Nunnally, Daniel Braum, Kimberly Long-Ewing, Duncan Eagleson, and serving as moderator was Charles Rutledge. This panel hammered the point home that comics are an underappreciated literary form, and that they definitely make worthwhile reading. It certainly made me sad for having stopped reading comics regularly many years ago. Then again, I suppose it’s never too late to start up again. At 1:00 John McIlveen interviewed the Necon Guests of Honor, Chuck Wendig, Seanan McGuire, and Paul Tremblay. While I enjoyed all the guest of honor interviews, I have to admit I was most interested in listening to Paul Tremblay speak. I first met Paul back in the late 1990s when we did some group book signings together for the vampire anthology THE DARKEST THIRST in which we both had stories. It was my first pro sale as a matter of fact. I’ve enjoyed following Paul’s career over the years, as his successes have been a nice inspiration. I’m looking forward to reading his much talked about novel A Head Full of Ghosts. The 2:30 panel was probably the most heavily attended panel of the entire weekend. Faustian Bargains & Plans for the Afterlife: Knowing Your Rights and Protecting Your Work Regarding Writers’ Contracts and Literary Estate Planning was also the most serious panel of the weekend, as well as one of the best. Moderated by horror author and attorney Bracken McLeod, and featuring Christopher Golden, Brett Savory, Richard Dansky, Heather Graham, and Chet Williamson, this panel served as “everything you wanted to know about the legal aspects of writing but were afraid to ask.” It covered contract language, rights, wills and estate planning, and all sorts of other legal matters. The 90 minutes allotted for this panel still wasn’t enough, as it went past its finishing time. It proved so popular that later at the Necon Town Meeting it was agreed that there would be a follow-up panel and perhaps even a workshop at next year’s NECON. At 4:00 it was time for Almost Human: The Art of the Monster, moderated by Cortney Skinner and including artists Duncan Eagleson, Jill Baumann, Ogmios, Rhea Ewing, and Glenn Chadbourne. The panel featured a lively discussion about traditional drawing and painting vs. digital drawing and painting, which has come so far and yields such impressive results it’s difficult to ignore, and for most on the panel it’s warmly embraced. After dinner, I attended the Artists’ Reception at 6:30. It’s always a highlight of the weekend to walk through the gallery to see the latest prints, paintings, drawings, and sculptings by the featured artists. This year I bought a colorful rendition of Carl Kolchak by Cortney Skinner. This digital print of the popular NIGHT STALKER character contains a NECON in-joke, as one of the items in the painting has a NECON history. During the reception coffee and some mighty delectable desserts were served. At 7:30 it was Live DVD Extra: Director’s Showcase where some new film shorts were shown, including Lynne Hansen’s CHOMP and Izzy Lee’s POSTPARTUM. Both Hansen and Lee were available for questions and answers afterwards. At 9:00 it was time for The Infamous Necon Roast. This year’s roastee was Sephera Giron, who was a real sport about the whole thing and seemed genuinely relaxed and appeared to be having a good time, which is how it should be. As always, the roasters were hilarious, and included Christopher Golden, Mary SanGiovanni, Cortney Skinner, Linda Addison, Monica O’Rourke, Nick Kauffman, Jack Haringa, Jeff Strand, and Brian Keene. All these folks are entertaining, although my personal favorite is Cortney Skinner whose impeccable timing is unmatched and who has the whole “Bob Newhart” deadpan mastered like a pro. Afterwards it was more Saugies and socializing on the quad into the wee hours of the morning, since Saturday night is the last night at the con till next year. Today’s 10:00 panel was It Only Laughs When I Hurt: Comedy and Genre, a panel that looked at humor and horror and featured Craig Shaw Gardner, Hal Bodner, Jeff Strand, John McIlveen, Frank Raymond Michaels, and was moderated by P.D. Cacek. The panel included many neat moments, amongst them Frank Raymond Michaels citing ABBOTT AND COSTELLO MEET FRANKENSTEIN (1948) as one of the all-time best horror comedies, and the discussion of how to effectively mix humor and horror by placing horror characters in a comedic situation, and vice versa by placing comic characters into a horror situation. At 11:00 it was time for the Necon Town Meeting, the chance for folks to give the Necon committee feedback about the weekend. It was agreed by all that NECON 35 was another grand success. At lunch, I sat with Nick Cato and his wife Ree, and before leaving for another year, I made the rounds and said goodbye to as many folks as possible, including Craig Shaw Gardener, Barbara Gardener, Matt Bechtel, and Laura Hickman. I’m never able to see everyone during the weekend, but here are some folks I did get a chance to spend some time with or at the very least exchange a quick word with: Linda Addison, Meghan Arcuri-Moran, Matt Bechtel, Hal Bodner, Mary Booth, Ginjer Buchanan, P.D. Cacek, Sara Calia, Bill Carl, Nick Cato, Ree Cato, Glenn Chadbourne, JoAnn Cox, Dennis Cummins, Don D’Ammassa, Richard Dansky, Barry Lee Dejasu, John Dixon, Dan Foley, Gary Frank, Barbara Gardner, Craig Shaw Gardner, Christopher Golden, Scott Goudsward, Catherine Grant, Jack Haringa, Laura Hickman, Nicholas Kaufmann, Brian Keene, Nate Kenyon, Dan Keohane, Paul McMahon, Bracken Macleod, Elizabeth Massie, John McIlveen, Frank Raymond Michaels, James Moore, Mike Myers, Jose Nieto, Errick Nunnally, Monica O’Rourke, David Price, Matt Schwartz, Cortney Skinner, Jeff Strand, Paul Tremblay, Tony Tremblay, K.H. Vaughn, Bev Vincent, Sheri White, Scott Wooldridge, and Trish Wooldridge. Another memorable NECON has come and gone. Thanks to the Booth family, including Mary Booth and Sarah Calia, and Matt Bechtel, and the entire NECON committee and volunteers, for all the hard work they did to pull off yet another amazing con. Welcome back to THE QUOTABLE CUSHING, that column where we celebrate classic lines of dialogue from Peter Cushing movies. Today we look at the final Dracula movie starring both Christopher Lee and Peter Cushing, THE SATANIC RITES OF DRACULA (1973). Hammer made the ill-fated decision— influenced by the enormous success of Dan Curtis’ THE NIGHT STALKER (1972) which featured a superhuman vampire terrorizing modern day Las Vegas— to update their Dracula series to modern times. And so they came out with DRACULA A.D. 1972 (1972) which brought Dracula (Christopher Lee) into the 1970s in the midst of the far-out groovy man culture while taking on Lorimer Van Helsing (Peter Cushing), a descendant of the original Van Helsing. DRACULA A.D. 1972 bombed at the box office, which meant Hammer’s follow-up, THE SATANIC RITES OF DRACULA, received a small release and didn’t make its way to the United States until five years later in 1978, under the alternate— and inferior— title COUNT DRACULA AND HIS VAMPIRE BRIDE. I’ve always preferred the campy DRACULA A.D. 1972 over the more serious THE SATANIC RITES OF DRACULA. DRACULA A.D. 1972 is high camp and as such is a terribly fun movie. THE SATANIC RITES OF DRACULA tries to make Dracula a manipulative Bond-like villain, but the film just isn’t ambitious enough to work on this level. Another reason I’ve never been a big fan of SATANIC RITES— and don’t get me wrong, I still like this movie— is that Peter Cushing doesn’t really have many memorable scenes or lines of dialogue in this movie. The plot in SATANIC RITES largely follows Scotland Yard Inspector Murray (Michael Coles), back from DRACULA A.D. 1972, as we works closely with British intelligence as they try to break up a mysterious satanic cult which happens to be run by Dracula. The intelligence agency is interested in this cult because some of the most powerful men in the country, including the head of their department, belong to it. Peter Cushing’s Van Helsing is called in by Murray as a consultant, and he helps with the investigation, which of course, ultimately leads them to Dracula (Christopher Lee). While there really aren’t a whole bunch of memorable Peter Cushing quotes in THE SATANIC RITES OF DRACULA, there are some. Here’s a look at some of these lines from THE SATANIC RITES OF DRACULA, screenplay by Don Houghton. INSPECTOR MURRAY: So, what do you think, professor? Is it just a black mass ritual? VAN HELSING: No. No, not exactly. In the Dark Ages, the worship of natural substances was quite common. Soil, water, sand of the desert, various plants. But the strongest cults were those that worshipped the most mystical substance of all, the fountainhead of life itself, the glorification of blood. And more often than not, human blood. TORRENCE: Are these men involved in this business because they’re under some kind of threat? Or drugs? VAN HELSING: Or hypnosis? This particular evil is more potent, more addictive than heroin, I assure you. And the end result is just as fatal. KEELEY: Evil rules, you know. It really does. Evil and violence are the only two measures that hold any power. Look at the world— chaos. It is a preordained pattern. Violence, greed, intolerance, sloth, jealousy. The deadly sins. All the deadly virtues. The Supreme Being is the devil, Lorimer. Serve him, and he offers you immortality. He’ll remove death, the common enemy. Nothing is too vile. Nothing is too dreadful, too awful. You need to know the terror, the horror, Lorimer. You need to feel the threat of disgust, the beauty of obscenity. VAN HELSING: Julian! In God’s name! At which time Peter Cushing grabs Jones by the shoulders and slaps him across the face, in order to slap some sense into him. The best scenes in this one are when Van Helsing and Dracula confront each other. Van Helsing’s investigation has led him to a rich tycoon named D.D. Denham who seems to be financing the cult. Denham is a recluse, and Van Helsing wisely believes that Denham is really Dracula. When Van Helsing arrives at Denham’s high rise office, Denham aims a bright desk lamp at him, to prevent Van Helsing from seeing his face. Denham also speaks with an accent. These are both attempts by Dracula to conceal his identity from his adversary. 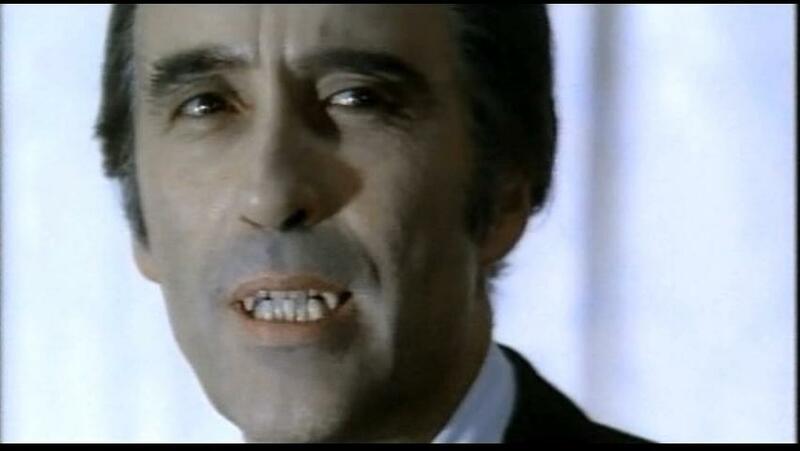 Christopher Lee chose to do this scene with a Bela Lugosi accent in homage to his Dracula predecessor. DENHAM: I have been expecting you. VAN HELSING: I rather thought you might. DENHAM: There is a group of us who are determined that the decadence of the present day can and will be halted. A new political regime is planned. However, Van Helsing is not swayed. VAN HELSING: Evil begets evil. There is an unholy aura in this place. And it is not a question of a little occultism, or a touch of mysticism, Mr. Denham. It is vampirism. And there’s a host of damned souls at Pelham house. What are you going to do with me? You can’t let me go, can you? I know too much. Do you mind if I smoke? A bad habit, I know, but it helps me to concentrate. At this moment, Van Helsing “accidentally” knocks some books off Denham’s desk. When he bends down to pick them up, he secretly slips in a Bible and places it on Denham’s desk. DENHAM: You are an interfering man, Professor. Do not meddle, or you will have to deal with me! As Denham pounds his desk, his fist lands on the Bible, and he hisses in pain as his hand sizzles with burning smoke. Van Helsing leaps from his chair and turns the light on Denham’s face, seeing clearly that D.D. Denham is indeed Count Dracula. VAN HELSING: You are Count Dracula! Of course, Mr. Denham, the powerful recluse. Here, you’re safe. No one expects to see him in the daytime. Van Helsing pulls out a crucifix and prays in Latin. He then pulls out a gun and aims it at Dracula, and Dracula smiles. When Dracula next speaks, it is no longer with an accent but in Lee’s deep resonating voice. DRACULA: Foolish man. Bullets cannot harm me. VAN HELSING: A silver bullet! Dracula stops smiling, but his fear is short-lived, as members of his cult come to his rescue and overpower Van Helsing. They tell Dracula to kill Van Helsing, but Dracula explains that he has other plans for his nemesis. DRACULA: It cannot be made so simple for him, not for Van Helsing. Nor for his granddaughter. And it’s Lee’s Dracula who gets some of the best lines during the film’s climax. Dracula leans into the unconscious Jessica Van Helsing while he speaks to a restrained Van Helsing. DRACULA: The girl you love is mine already, and through her you will yet do my bidding. Sorry, Drac, you never win in these movies. Peter Cushing’s Van Helsing always gets the upper hand. DRACULA: My revenge has spread over centuries and is just begun! Wrong again. You’re about to be destroyed by Van Helsing for the final time. Okay, that’s it for now. I hope you enjoyed today’s QUOTABLE CUSHING column on THE SATANIC RITES OF DRACULA. 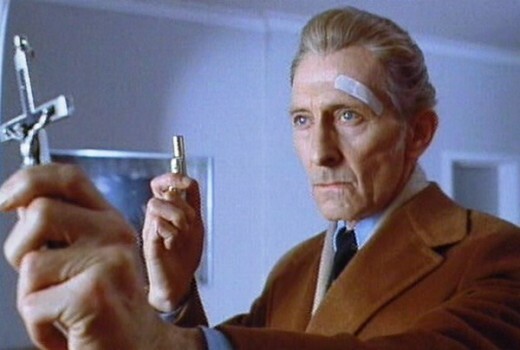 Join me again next time with more quotes from another Peter Cushing movie. Today we look at memorable quotes from one of my favorite horror movies from the 1970s, THE NIGHT STALKER (1972) starring Darren McGavin in the role that most of us consider to be his signature role, the inexorable reporter Carl Kolchak. This movie is so good it’s easy to forget that it was a made-for-TV movie. In fact, it earned such high ratings when it premiered on television on January 11, 1972 that in a largely unprecedented move, it was released theatrically after it played on TV because the film was that popular. Amazing. And it really is a superior horror movie, which is no surprise since it was produced by Dan Curtis, the man behind the Dark Shadows phenomenon. The other thing to remember is that this was a time, the early 1970s, when a plethora of quality made-for-TV horror movies were being released to the television-viewing public. THE NIGHT STALKER is probably the best of the lot. It’s also an incredibly lean production, as it clocks in at just 74 minutes. There isn’t an ounce of fat on this baby. Not only is this movie about a superhuman vampire on the loose in modern day Las Vegas terrifying, but it also introduced the character of Carl Kolchak to the world, a character Darren McGavin would reprise in a sequel THE NIGHT STRANGLER 1973) and then in the weekly TV series The Night Stalker which sadly only lasted one season. THE NIGHT STALKER boasts a fantastic script, and you would expect no less since it was written by Richard Matheson, based on an unpublished novel by Jeff Rice. The legendary Matheson wrote a ton of movies and so it would be difficult to call THE NIGHT STALKER his best screenplay, but I will say that for me, it’s probably my favorite screenplay that Matheson wrote. Some of the best dialogue in the movie comes from scenes where reporter Carl Kolchak (Darren McGavin) argues with his editor boss Tony Vincenzo (Simon Oakland), as Kolchak is constantly trying to print stories that a vampire is on the loose in Las Vegas, while Vincenzo, under pressure from the local authorities, is doing his best to quash them. KOLCHAK: Did I say it was a vampire? VINCENZO: What does your suggested headline say? KOLCHAK: The story makes it clear. VINCENZO (reading): “Vampire killer in Las Vegas, question mark.” Do I misread? KOLCHAK: The story makes it clear! VINCENZO: Did I misread or did you use the word “vampire”? KOLCHAK: Some screwball who imagines he’s a vampire is loose in Las Vegas, and the people ought to be told. VINCENZO: If there’s a screwball running around loose in Las Vegas, his last name begins with a K! KOLCHAK: What do you want, Vincenzo? A testimonial from Count Dracula? KOLCHAK: What is this out, out, get out game we play? This nut thinks he’s a vampire! He’s killed four, maybe five women! He has drained every drop of blood from every one of them! Now that is news, Vincezo. News! And we are a newspaper! We’re supposed to print news, not suppress it! THE NIGHT STALKER also does an amazing job early on building up a sense of unease and eeriness before the brutal vampire actually makes his appearance, as in this scene where the police find another dead body. The body is lying in a sandy pit, far away from where the struggle seems to have taken place, and there are no footprints leading towards the body other than those belonging to the police. Of course, Kolchak is right alongside the police here. POLICE OFFICER: This girl lost a lot of blood, Sheriff, but she didn’t lose it here. SHERIFF BUTCHER: (calling to other officers): Anything? OFFICER #2 (in the distance): We found a purse! There’s signs of a struggle up here! SHERIFF BUTCHER: But nothing in between. Only our footprints. KOLCHAK: What’d he do? Throw her? CORONER: We found the death in each case was extremely swift, coming in something like less than a minute. After the initial wounds were inflicted, the blood was drained very quickly, some kind of suction device being used. Now this would explain why no blood was found anywhere in the victims or in the areas where they were discovered. KOLCHAK: Doctor— Kolchak, Daily News. Do you have any idea what could have made these wounds? CORONER: They’re not unlike the bite of a medium-sized dog. SHERIFF: What do you mean, dog? DISTRICT ATTORNEY: What? Dog, dog! What are you telling us? A dog did these murders? CORONER: I didn’t mean to indicate that the wounds were actually inflicted by a dog, only that they’re similar to those which might be caused by a dog. A rather interesting point is we found another substance mixed in with the traces of blood in the throat wounds, namely saliva. SHERIFF: What do you mean, saliva? CORONER: I mean saliva, Sheriff Butcher. Human saliva. DISTRICT ATTORNEY: What do you mean “human”? Are you suggesting that each of these women were bitten in the throat by a man? CORONER: At present, the evidence points that way. However I couldn’t and wouldn’t hazard a guess as to motivation. I could only be sure they each died from shock, induced by massive loss of blood. KOLCHAK: Is it possible that he killed these women by biting them in the throat for the express purpose of drinking their blood? SHERIFF: Kolchak, now you’re here by the mutual suffrage of us all! SHERIFF: Whatever it is! Just shut up! KOLCHAK: Now, I was at the hospital yesterday, and a lot of things were happening that you just simply cannot explain away. Sheriff, your own men shot at him, some at point blank range. How come it didn’t even slow him down? How come a man over 70 years old can outrun a police car? How come this same man when slugged in the head doesn’t even bleed? How come, indeed! If you haven’t seen THE NIGHT STALKER, you’re missing one of the best horror movies of all time. Check it out! KOLCHAK: Judge for yourself its believability and then try to tell yourself, wherever you may be, it couldn’t happen here.